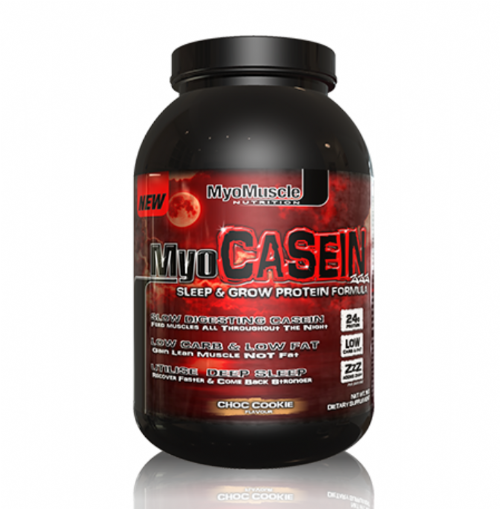 MyoCASEIN is exactly what a night time protein supplement should be - a sustained release, high quality protein blend which is juiced up with natural ingredients known to promote a deeper and more restful sleep. Why does this matter? It’s a fact that deep sleep promotes recovery and muscle growth! However, that is only half of the equation. To recover and grow your body needs a steady supply of ingredients to build with while you sleep! The unique protein blend we developed for MyoCASEIN is the ultimate choice for growth and recovery! It’s all well and good getting 8 hours sleep but not if your body is starved, it will literally be forced to eat itself and your hard earned gains! With MyoCASEIN those worries are a thing of the past! Unlike other forms of protein which can completely pass through your gut in less than 2 hours MyoCASEIN’s casein rich protein blend delivers sustained release protein to feed your muscles for up to 7 hours while you sleep! With protein circulating in your system your body is forced into a highly anabolic state which is essential when it comes to recovery and muscle building! 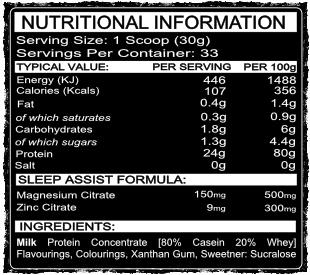 Don’t starve your muscles, feed them all night long with MyoCASEIN!